A complete re-imagining of Clarissa Explains it All as 20-something Clarissa tries to navigate the unemployment line, mompreneurs and the collision of two people in love. She was a smart, snappy, light-hearted girl who knew it all at fourteen. Now a woman in her late twenties, her searching blue eyes are more serious, but mostly amused by the people around her. The gap-toothed smile that made her seem younger than she really was is gone, but she still lightens up the room. Her unpredictable wardrobe rocks just like when she was a kid, but her fashion sense has evolved and it makes men and women turn their heads. After leaving high school early, Clarissa interned at the Daily Post while attending night school. At the ripe old age of twenty- two she had it made – her own journalism beat (fashion, gender politics and crime), an affordable apartment in FiDi and a livable wage. She was so totally ahead of the game. Ah, those were the days! All three of them. Remember the Stock Market Crash of 08? Remember when people actually bought newspapers? All of Clarissa’s charming obsessions, charts, graphs, and superstitions have survived into adulthood, but they’ve evolved into an ever-greater need to claw the world back under control. Her mid-twenties crisis has left her with a whole set of things she can’t explain: an ex-boyfriend turned stalker, her parents’ divorce, a micro relationship with the cute coffee guy, java addiction, “To-Flue Glue,” and then there’s Sam. Where’s Sam anyway? Things I Can’t Explain is about knowing it all in your teens and then feeling like you know nothing in your twenties. First sentence: Was it Malcolm Gladwell who said, “Where you’re standing now is not where you’re going to be”? Confession: I never watched Clarissa Explains It as a kid. I was very, very, very young when it aired and went off the air. What I know about it are: it had Melissa Joan Hart in it, Clarissa talked to the camera a lot (breaking that fourth wall! ), and Clarissa had a best friend named Sam who climbed into her window a lot. Who is Clarissa? Who is she indeed! Clarissa was the central character in an beloved early 90s show called, Clarissa Explains It All, who liked to address the camera and talk about everything from boys, puberty, and all things that teenage go through. In Things I Can’t Explain, Clarissa is back; she’s in her late 20’s, and is dealing with adult things like unemployment, boyfriends, and so on. She’s just as smart and sarcastic as ever (but that depends on who’s asking). What happened to Sam? That’s what everybody’s wondering. Well, he isn’t climbing in Clarissa’s window anymore. (I don’t think he’d want to climb a New York City fire escape.) Sam is mysteriously absent in this book. Why? You learn a bit about what happened between the end of the show and the start of this book. It’s kind of sad because they were supposed to be best friends forever (and perhaps even more)! I was actually disappointed that he didn’t appear. What is Clarissa dealing with? When The Daily Post, goes belly-up, Clarissa becomes unemployed and begins the search for a new job, unsuccessfully. She has to deal with the consequences of lying to her parents about her job (that she still works at the Daily Post) and her love life (that she has a boyfriend when she actually doesn’t). She’s nursing a crush on CCG, aka Cute Coffee Guy, and works up the courage to say more than one thing to him. 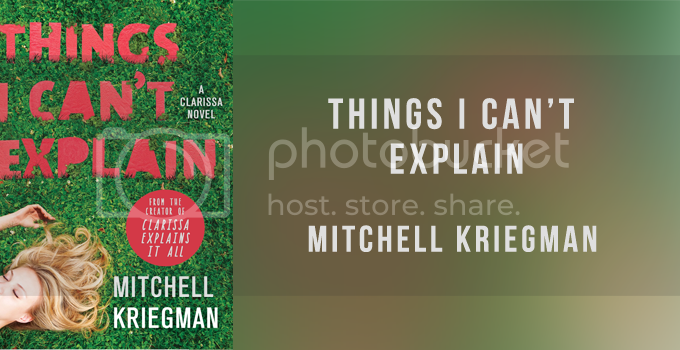 Clarissa’s dealing with things that everybody of all ages deal with, and I find that incredibly relatable, especially her unemployment, which struck a cord with me because it’s strange to be thrust back into the world after a cushy job or life. Where do you go from there? I understand, Clarissa. Who are the guys in her life? There’s CCG, who Clarissa crushes on; Norm, Clarissa’s stalker ex-boyfriend, who talks about himself in the third person; and Dartmoor Millburn, who works at Clarissa’s new work place and you can obviously tell how uppity he is with that ridiculous name. Don’t worry. It’s not a love triangle or a love square. You do get a pretend boyfriend! Clarissa ropes CCG, aka Nick, to play the boyfriend she’s been talking about to her parents. I like this trope, but I couldn’t root for Clarissa and CCG because the chemistry between them was incredibly lackluster. It was like a push and pull—will they or won’t they—with crazy exes and whatnot. You get a stalker ex-boyfriend who wasn’t as bad as I thought he would be. He’s just a dudebro who needs a to grow up. You also get Dartmoor, who I couldn’t help but imagine Nigel Thornberry’s accent because of the name. They were all just lacking, and didn’t feel fully developed characters. Do we get her charts and graphs? Yes! Good ole Clarissa never fails to show off her charts, graphs, lists, and definitions. It really translates well in the book. I love seeing these because it was a great way of conveying information through picture-form. It’s very true to Clarissa’s style. There were terms she used and defined like “micro-relationships” and “serendumpity” that I really enjoyed. It’s interesting to see what’s in Clarissa’s head. How was the book? Honestly? It was okay. Not the most exciting or new. It was light and quick with slightly ridiculous things that happened. I didn’t feel like any of the characters felt real—they were cliche portrayals of people navigating adulthood. It wasn’t anything new, and it felt very rushed. This book reminded me of the women’s fiction books I’ve read. Would it have made a difference if I had watched Clarissa Explains It All? Maybe! Reading this book, I did understand a bit why 90s kids would love Clarissa. I just wish I could’ve did a bit of nostalgic comparison, but that’s okay. Do I recommend Things I Can’t Explain? If you want a light and quick read about a girl navigating adulthood, give Things I Can’t Explain a try. If you’re a Clarissa Explains It All, read it just to see if it reminds you of your childhood. Sorry you didn’t really love this one. I’m definitely curious – I did watch the show when I was younger, but not religiously so I’m sure there are plenty of things I don’t remember. Aw, that’s a bummer Sam doesn’t appear though!